I am always pleased to know that my husband is with you... || I hope to set him at odds with such an awful acquaintance. 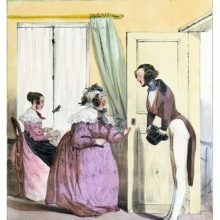 A woman walks her husband and a friend of his to the door as they are on their way out of the apartment. 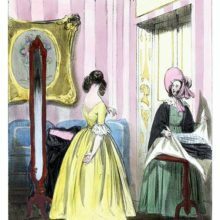 The caption reads in the original French: Je suis toujours satisfaite de savoir mon mari avec vous… || J’espère bien le brouiller avec une aussi mauvaise connaissance.